This action allows you to check for the existence of a specific file or folder. You can choose to fail the action if the file or folder exists, or if the file or folder is missing, or not to fail at all. You can also choose a variable to set. Its value will be set to "True" if the file or folder exists, or "False" otherwise. 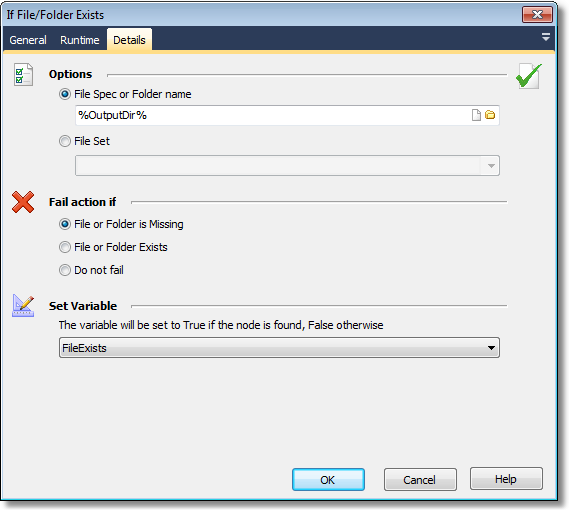 When using the Do not fail option, you should specify a variable to hold the result of the file check. 1. Specify the name of the file. 2. On the Details tab, choose Fail Action If - File or Folder is Missing. 3. Do not specify a variable. The build will immediately abort if the required file is missing. The user should be warned if any files are present in a directory. 3. On the Runtime tab, select Fail Action If - Do not fail. 4. Create a (nested) sub-node with the required warning behaviour. The build will skip the sub-node if the file is not present, but will keep running. 2. Choose "Do not Fail"
3.Specify the name of a variable which will indicate the presence of the file. 4.In a later "If...Then" step, use the name of the variable. "True" indicates that the file exists. "False" indicates that the file does not exist.